Hotel Rhino Land | The Best Budget Traveler's Bed & Breakfast Choice in Sauraha, Chitwan National Park, Nepal. Since 2012. 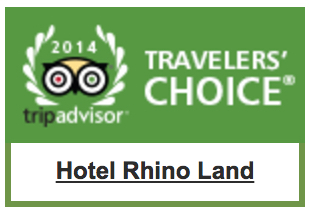 Welcome to Hotel Rhino Land, the perfect place for those who travel on a budget. We are the best choice hotel in Sauraha (Chitwan National Park, Nepal), open since December 2012. We are ideally located, in a very quiet and peaceful neighbourhood, close to the elephants’ stables, just 3 minutes walking from the town center and the park entrance. We have 11 large rooms with private bathrooms, ceiling fans, 24-hour hot shower and clean beds – single and double, each with its own mosquito net. We provide free WiFi Internet access, free parking, free information regarding the Chitwan National Park, professional guide service (including free Tharu village visit and sunset point), restaurant service (6.00 AM – 9.00 PM) and laundry service. We have a big and beautiful front yard and a well cared garden full of flowers, so that you can relax in the best conditions after an intense day spent in the jungle. The balcony offers a scenic view. You’ll never forget the sunrise over the vivid yellow mustard fields, rice fields and Tharu village huts. Yes, we did it again! We did it together!! So congratulations to you, our dear and kind visitors, who keep on promoting us. 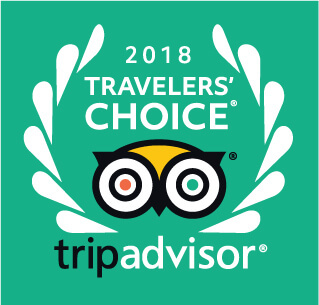 In 2018, we are again the TRAVELERS’ CHOICE in Sauraha, Chitwan! …and the good news keep coming! We’ve just got the CERTIFICATE OF EXCELLENCE 2018 as well! We are happy & proud to announce a new Trip Advisor award: the CERTIFICATE OF EXCELLENCE 2016! Kudos to all of you, our beloved guests who positively reviewed our place and made this possible. This award means a lot to us and reinforces our commitment to strive harder in order to serve you even better. Our first Certificate of Excellence, awarded by Trip Advisor. Thank you all, our dear guests and friends. We happily & proudly announce you that we’ve just won a very important award!!! We know the real winner is you, our beloved guests. Without you, this award wouldn’t have been possible. We feel humbled and we promise you to keep on offering you the best services possible at very affordable prices. 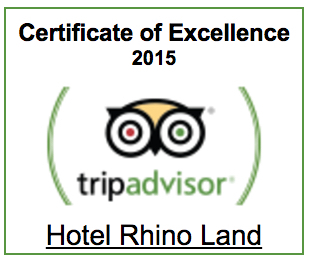 Thank you again and we wait you back here, at Hotel Rhino Land, in Sauraha, Chitwan, Nepal. We love you all. Peace. Congratulations to you, our dear and kind visitors, who made it possible in 2015, 2016, 2017 and 2018. Our first certificate of excellence, awarded by Trip Advisor in 2015. It makes us feel proud, but more committed as well. Our first Trip Advisor award, in 2014.